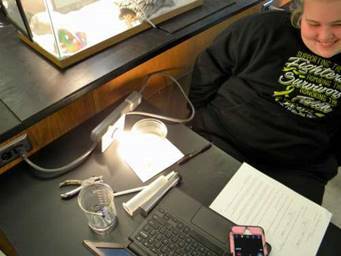 Is light important for photosynthesis? Photosynthesis is the process by which plants take carbon dioxide from the atmosphere, add water, and use the energy of sunlight to produce sugar. Photosynthesis occurs in the chloroplast, an organelle in plant cells that contains the molecule chlorophyll. Chlorophyll absorbs the energy of sunlight. That light energy is converted to chemical energy through the steps of photosynthesis. 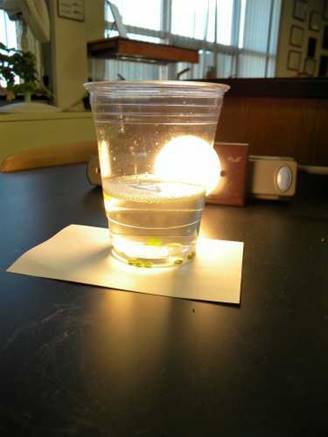 The reactions of photosynthesis can be divided into two major types: light-dependent reactions and light-independent reactions. The light-dependent reactions convert energy from the sun into a form that the chloroplast can then use to make sugar from carbon dioxide, in the process producing oxygen as a waste product. The light-independent reactions use that energy to make glucose from carbon dioxide and water. Leaf disks float, normally. When the air spaces are infiltrated with solution the overall density of the leaf disk increases and the disk sinks. The infiltration solution includes a small amount of sodium bicarbonate. Bicarbonate ion serves as the carbon source for photosynthesis. 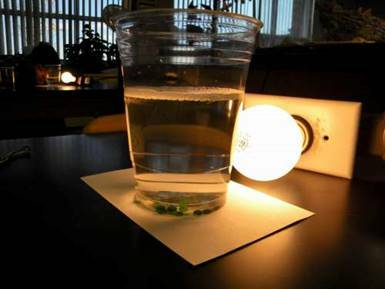 As photosynthesis proceeds oxygen is released into the interior of the leaf which changes the buoyancy causing the disks to rise. The light depended reaction of photosynthesis also uses water in conjunction with two photosystems (PII / PI) to create ATP and NADPH using H+’s and e-’s. 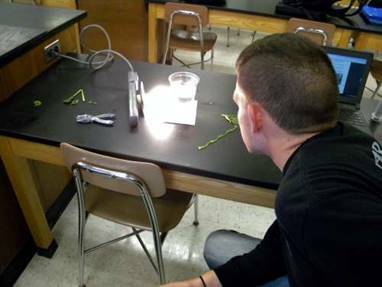 The hypothesis is that if plant disks are exposed to CO2 , water and light during the photosynthesis process, then the disks will form oxygen as a by-produce and float. 1. 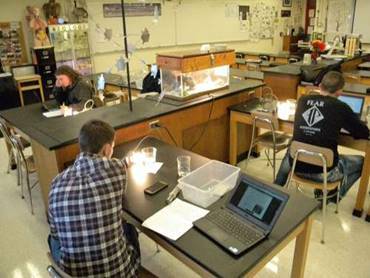 Gather all necessary materials in order to conduct the lab. - The bicarbonate will serve as an alternate dissolved source of carbon dioxide, which is introduced in the Calvin cycle to help provide carbon for glucose, for photosynthesis. - Using your 400 mL beaker, prepare .2% solution by measuring about 1.5 g of sodium bicarbonate (NaHCO3) into 300 mL of clean drinking water and stir until dissolved. - Add 2 small drops of liquid soap to your NaHCO3 solution and stir gently. The soap will wet the hydrophobic surface of the leaf allowing the solution to be drawn into the leaf. 3. Punch 20 uniform leaf disks with the round hole puncher. Note: Avoid major veins. - Remove the piston or plunger and carefully place the leaf disks into the syringe barrel near the tip. - Replace the plunger being careful not crush the leaf disks. - Pull on the plunger to draw in a small volume of sodium bicarbonate solution enough to suspend the leaf disks (~1/4th of the syringe full). 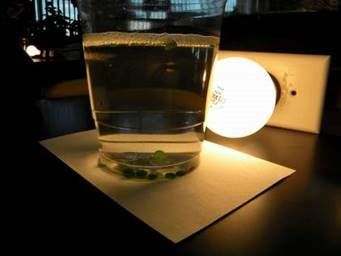 - Tap the syringe to suspend the leaf disks in the solution; they should be floating. - Slowly push on the plunger until no air remains in the barrel or nozzle; stop before any solution comes out. Again, leaf disks should be floating in the barrel of the syringe. - Holding a finger over the syringe opening, draw back on the plunger “gently” until you feel a slight press on your finger in order to create a vacuum for ~10 seconds. Very small bubbles may be coming off the leaves if you are doing this correctly. - Let off the vacuum (remove your finger) and swirl the barrel with the leaf disks around to see if they will sink toward the plunger of the syringe because of air space infiltration. Note: You may have to repeat the vacuum creating steps 3-5 times in order to get the disks to sink. Do not repeat too often because you could cause cellular damage. If most of the disks sank just do not count those that are still floating in the next step. 5. Remove the plunger over your clear plastic cup and allow all the solution and disks to fall into your cup. Add more bicarbonate solution from your beaker to a depth of about ¾ your cups total volume. 6. 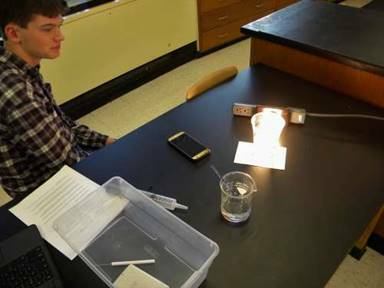 Place your cup directly near your light source, on a white notecard and start a timer. 7. Count and record the number of disks (see Data/Result Sheet) that float to the top within 10 minutes. Note: Some disks may stick to the cup or each other; you may swirl the cup with your stirring rod to release them but “only” count them if they rise to the top of your cup after swirling. 8. Clean, dispose, and dry all necessary materials. 9. Repeat steps 3-8 however do not use any light source but instead shade your cup with a paper towel as best as possible. 10. Clean and return all materials. Complete the Data/Result Sheet.